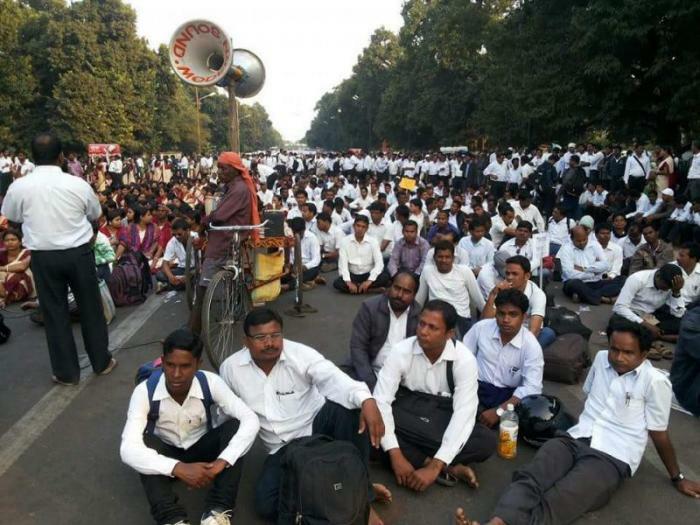 Bhubaneswar: The agitating block grant school and college teachers today decided to intensify the ongoing strike further as their talks with the Inter-ministerial committee headed by Finance Minister Sashi Bhusan Behera failed. Since August 16, the block grant school and college teachers had started a dharna at the Lower PMG here under the banner of Odisha School College Teachers’ and Employees’ United Forum (OSCTEUF), a forum of school and college teachers unions and also resorted to cease-work agitation by staging demonstration in block levels across the State. Around 60,000 teachers of 5,500 schools and colleges observed Teachers’ Day as a ‘black day’ recently to press for the fulfilment of their demands of better pay, service benefits, abolition of the block grant system and its replacement with 100 per cent ‘grants-in-aid’. Meanwhile, School and Mass Education Minister Badri Narayan Patra urged the teachers to shun the path of agitation. “We have asked teachers to withdraw agitation and give us a three-month time to constitute a steering committee and review the details,” informed School and Mass Education Minister Badri Narayan Patra after the meeting.